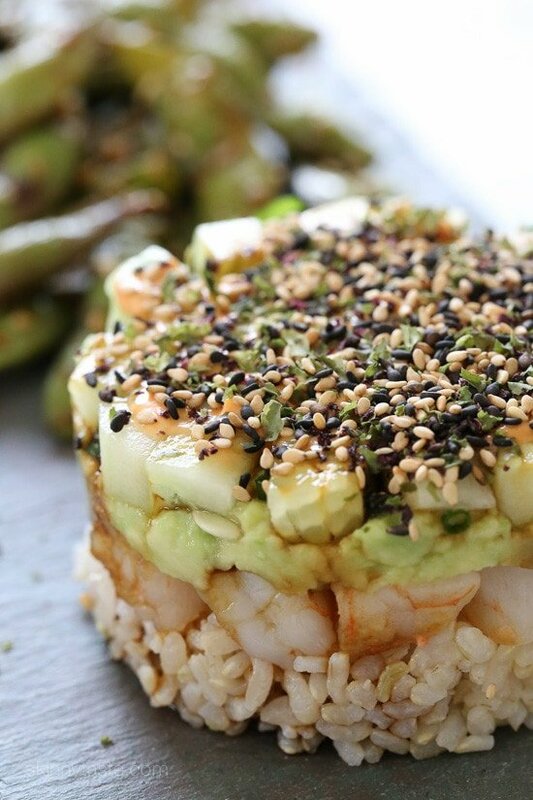 These EASY, Spicy California Shrimp Stacks will satisfy your sushi craving, and they taste SO GOOD! 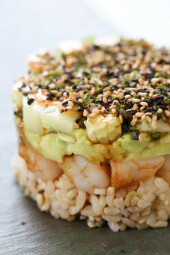 Layered with cucumber, avocado, shrimp and brown rice, then topped with a spicy mayo – YUM! You don’t need any fancy tools, I layered everything in a one-cup measuring cup then flipped it over. 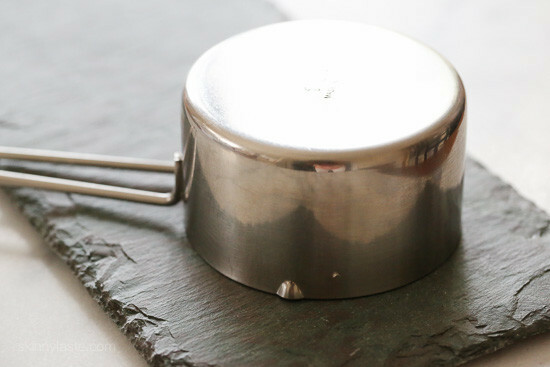 You can make it even easier by turning it into a bowl! It’s drizzled with spicy mayo, soy sauce and Furikake (affilialte link), a Japanese condiment made with blend of sesame seeds and seaweed and spices, or you can just use sesame seeds. 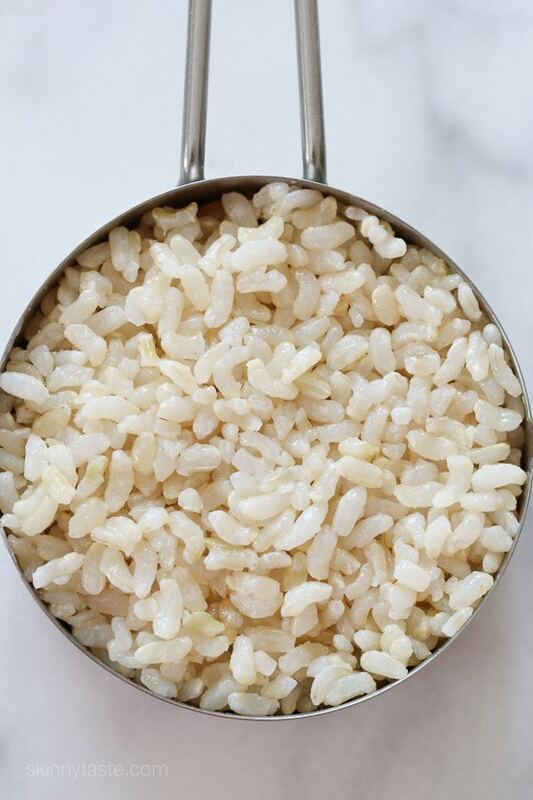 I’m obsessed with Trader Joe’s frozen brown rice, it’s a great short-cut for busy weeknights and the texture is perfect. Using their rice, this came together in less than 15 minutes. If you make the rice yourself, it’s best to use short grain rice like you get from most Asian restaurants, the sticky texture is perfect for this. This would also be great with crab meat to make a more traditional California roll, or even raw sushi grade salmon or tuna. Buy shrimp still frozen and defrost as needed. Most shrimp arrives at stores frozen so you may as well buy it frozen and defrost it as needed so it as fresh as possible. If your shrimp is raw, you can poach them quickly in a pot of salted, boiling water, for 2-3 minutes, until they are just pink. Then, rinse them under cold water to stop them from cooking. avocado, shrimp and brown rice, then topped with a spicy mayo – YUM! Cook rice according to package directions, omitting salt and oil. When rice is done, add rice vinegar and stir. Evenly spread rice on a sheet pan to cool. Cut shrimp into 1-inch cubes. 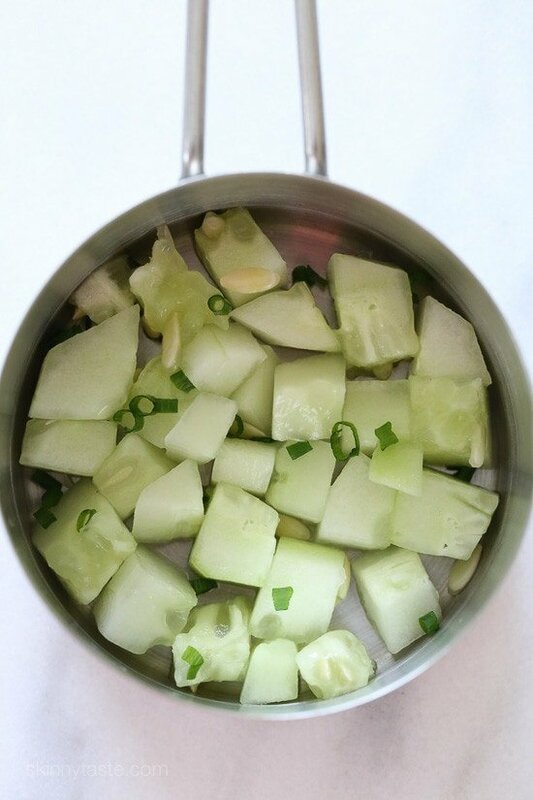 In a small bowl, combine cucumber and chives. In another small bowl, combine mayonnaise and sriracha sauce. 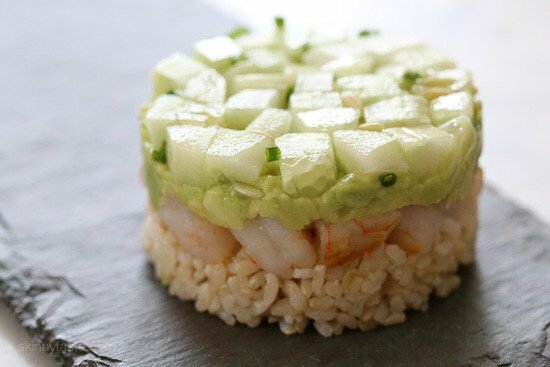 Using a 1 cup dry measuring cup, layer ¼ cup cucumber, then 2 tablespoon of avocado, then ¼ of the shrimp, and 1/3 cup rice. Carefully turn the cup upside down to turn the stack out onto a plate, lightly tapping the bottom of the cup if necessary. Sprinkle with Furikake and drizzle with 1 teaspoon soy sauce and sriracha mayonnaise. I love all of Gina’s recipes but this is my absolute favorite! The flavors are delicious together. I make it with cauliflower rice to have low carb but otherwise wouldn’t change anything. What could you substitute for the cucumber? Hubby does not like cucumber. 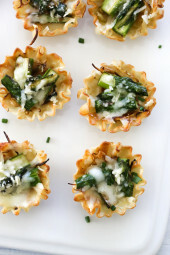 Another one of our favorite SkinnyTaste recipes. Planning to serve them to guests for dinner later this week. The combination of flavors is so delicious! Be sure to try and find the Furikake if you can because it enhances all the flavors. I found it at Whole Foods. These are genius! Amazingly delicious and so easy to make! My husband, who doesn’t have a lot of experiencaking food, made this for dinner tonight. It was terrific!! Loved this recipe! I added salt to the avocado and also drizzled some sesame oil over the top. Yum. I saw the suggestion to sub mango for the avocado. I can’t wait to try that! 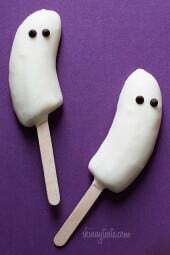 I have made these soooo many times!!! totally satisfies the sushi craving!! One of the best recipes on Skinnytaste, in my opinion. 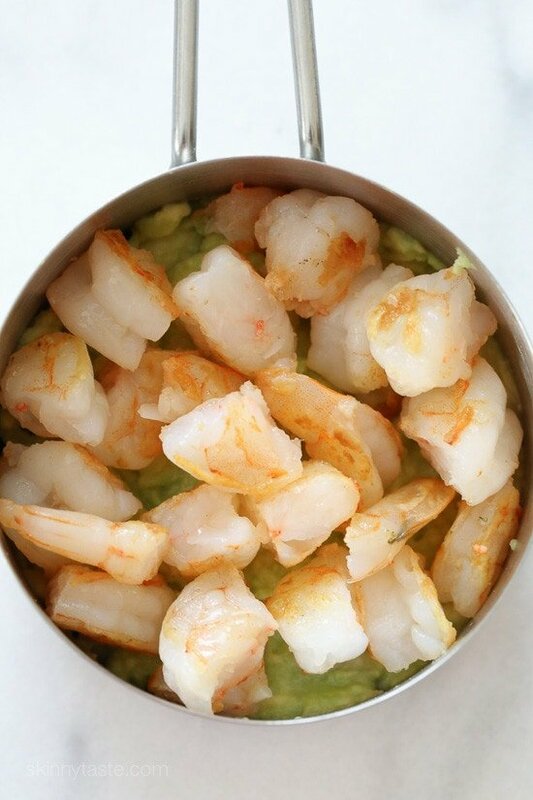 I simmered large shell-on shrimp in a frying pan barely covered with water, salt and pepper and a squeeze of lemon. I find shrimp is much tastier when cooked in their shells. I followed the rest of the recipe as written except for adding wasabi paste to taste to the mayo then thinning it with a little rice vinegar so I could drizzle it over the stacks. I served over a tossed salad with a homemade vinaigrette. Fantastic! Thank you Gina. You are a genius. Love this so much! 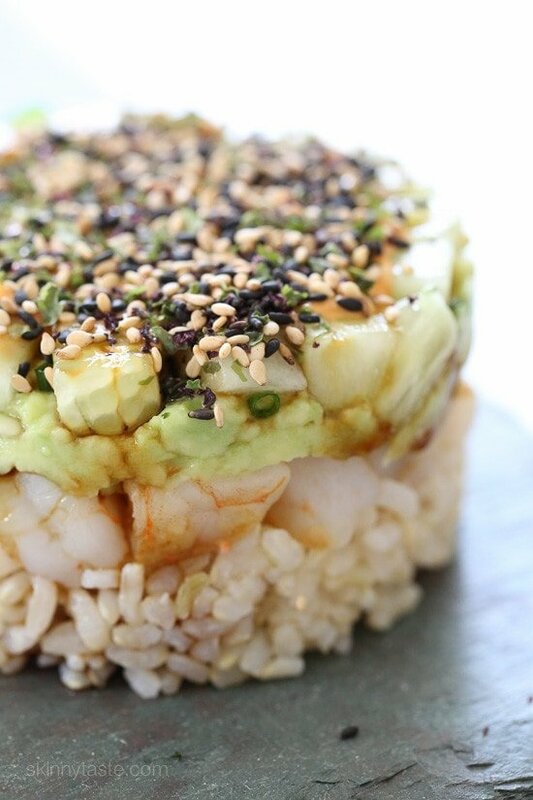 A great way to satisfy my sushi cravings while pregnant. This one’s added to a long list of Skinnytaste faves! Glad you enjoyed it Kelly! I give this 5 stars for sure: taste, presentation, nutrition, etc. This is a keeper recipe for sure. I have made it several times. It turned out great, thanks for the recipe! What suggestions do you have to serve this wirh to round out the meal? I’m doing WW. Thanks! Loved them! Can this be made ahead of time? Am trying it tonight with cauliflower rice instead. I’m allergic to avocado….what can I substitute?? Delicious and so easy! This is one of my newly found favorites for sure. Hi Gina! I love your recipes! Just wanted to drop you a line that I love this recipe so much that I linked to it in a recent recipe round-up post I wrote about healthy weeknight meals for busy families.This recipe is in constant rotation at our home, sometimes with variations but always yummy. Thanks for creating delicious recipes! This recipe is a crowd pleaser in my house! Looks so fancy, too! This was yummy! Will continue making. This was very good. But mixing the shrimp with the mayo was the way to go instead of drizzling it on top as the recipe said. I LOVE this meal! I used (raw) yellowfin tuna instead of shrimp. It turned out of the measuring cup without a problem. I also mixed wasabi paste into the soy sauce before drizzling over the stack. This is another keeper! This is so good! We also used some crab as well as shrimp for variety. I used a plastic measuring cup and packed the rice as tight as possible to hold everything together. They came out nicely when I kind of squeezed the sides and tapped on the top of the cup. 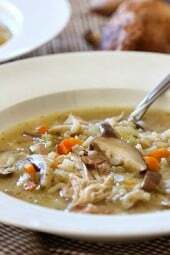 We have made the recipe several times and it is a family favorite on our meatless Friday menu. We used jasmine rice and it held together very well since it’s so sticky. I also made sure to pack it super tight. OMG this was so good!!! I didn’t layer it cuz I was food prepping so I added the avocado when I was ready to eat it. I also didn’t have chives(even though I swear I remember them being in the fridge!) so I used red onion super finely chopped. This was amazing!!!! 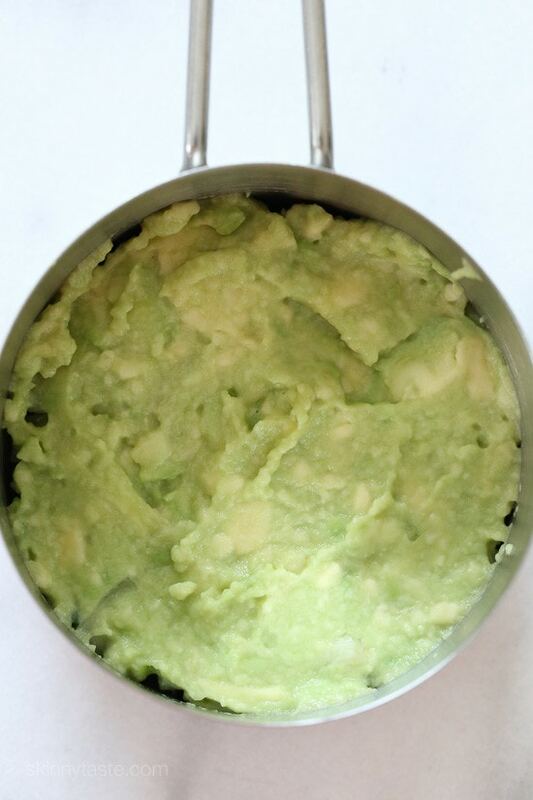 Can I make these ahead and refrigerate or will the avocado brown? I made this with sushi-grade tuna and it was soooooo good. The presentation on the plate made it feel like we were in a restaurant. This is a recipe I will keep and make again and again. Amazing!! So balanced. I had lobster tails in the freezer. Swapped the shrimp out for the lobster. This was a 10 out of 10. Has anyone ever subbed out the rice for cauliflower rice? we are doing whole 30 and we love these shrimp stacks for a busy night but would need to modify a little. I have! Its perfect. Tastes exactly the same! Did you still add the rice vinegar to the cauli rice? These were delicious and are becoming a weekly dinner item in our house. Since we live in the San Francisco area and have great fresh crab this time of year, I substituted the shrimp for crab. The presentation is stunning! Delicious! Perfect amounts of each ingredient. I was totally expecting my “stack” to fail, but it didn’t! It came out just like I hoped it would. We will be having this again! These were delicious! Thanks for another phenomenal recipe! 5/5 – Such and easy recipe, yet it impresses everyone! So fun, beautiful and tasty! I am excited to find this recipe! I found it on your Jan 22 Meal Plan. It sounds like a menu item I love at Nordstrom’s restaurant. I will be making this in the coming week.Thank you!!!! Love this recipe. So fresh and easy.